Had this match kicked off five minutes later the Bankies may have taken something from this encounter with Largs Thistle at Barrfields Stadium. 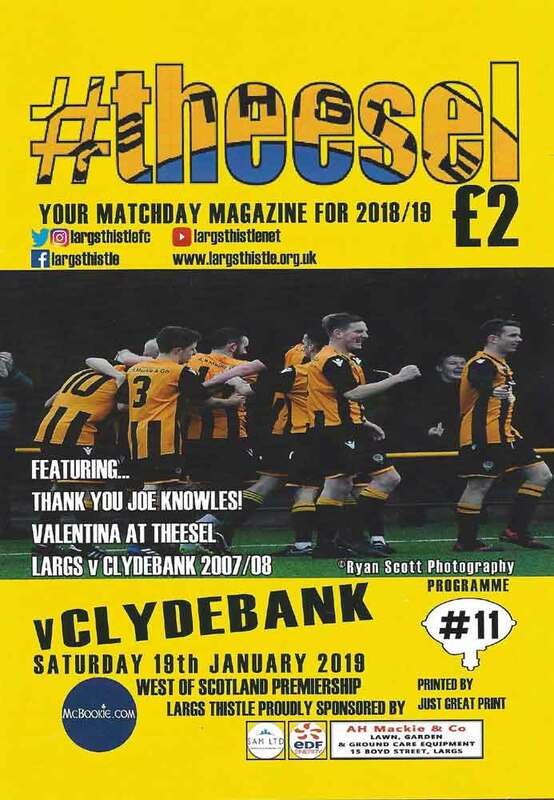 However, with the defence not showing up until 1.50pm, Clydebank already found themselves two goals down after four minutes and under the threat of a real pasting. The players managed to compose themselves after this and despite pulling a goal back they never really carried enough threat to get themselves back into the match. The same eleven who demolished Kilwinning Rangers last week started the match with Fitzpatrick on the bench alongside new loan signing from Partick Thistle, Lee Duncanson. The opening spell of this match is one that is best forgotten as the defence had a complete meltdown and gifted the home side two goals in the first four minutes. Firstly, a mistake from Darroch allowed Black to power through the defence on the left hand side where he chipped the ball across the box where John Carter was completely unmarked to head home a simple goal. It got worse just two minutes later as another mistake at the back was punished by Black who slammed the ball past Waters to make it two. The Bankies defence was all at sea and Struthers could have added a third when he blasted the ball over the bar when he should have done better. It looked like a hiding was on the cards when Muir was free in the box after seven minutes, but Waters produced a point blank save to keep the deficit at two. The Bankies finally managed to settle after this period and Hepburn was first to have a go at goal for the Bankies, but his twenty yard effort was about a foot wide of the post. As the game descended into a dull midfield battle, it was essential for the Bankies to score the next goal in the game, and after 25 minutes Nicky Little almost delivered. Bankies top scorer raced on to a through ball by Hepburn by nodding it past Farrell in the Largs goal. Unfortunately, he delayed his shot momentarily, and gave himself a tough angle to squeeze the ball into the goal allowing a Largs defender to desperately clear away for a corner. This only delayed the goal by seconds however. From the corner kick, Farrell allowed the ball to slip from his fingers and as it bounced about in the six yard box, Alan Vezza put his head on it. Despite having men on the line, Largs could not prevent the ball crossing the line. Clydebank huffed and puffed for the remainder of the half finding it difficult to get in behind the Largs defence. The only moment of note was when Jordan Shelvey was brought down in the box moments before the break, but ref Connor Ashwood emphatically waved away the claims. Three minutes after the restart, Clydebank had about their best chance of the match to equalise. Andy Paterson cut in from the left hand side and sent in a fine drive that was parried to the side by Farrell. Liam Rowan followed up with what looked like a certain goal only to be thwarted by a miraculous clearance on the line by a Largs defender. 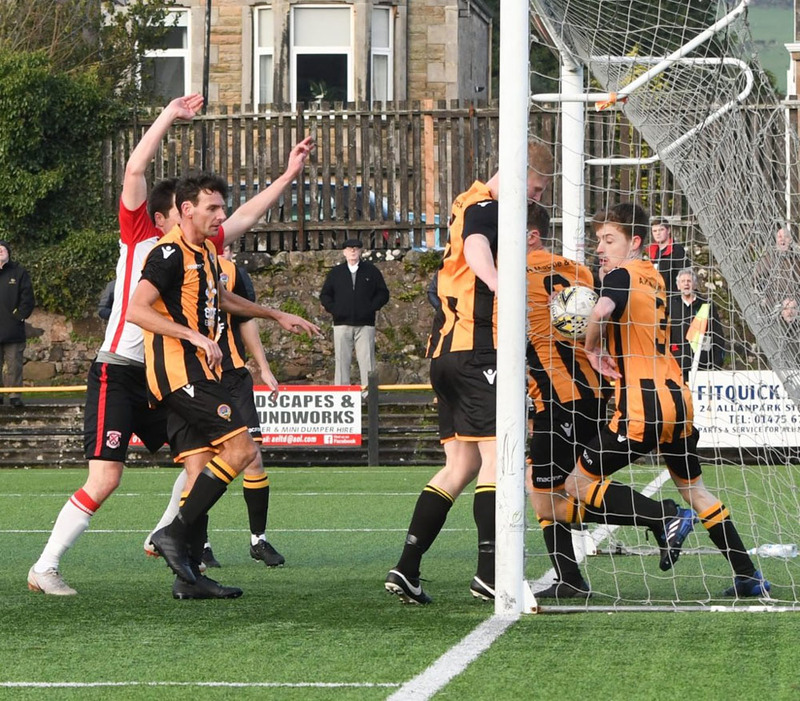 Largs had created virtually nothing since the opening seven minutes of the match, and seemed content to just restrict any opportunities from the Bankies attack and by and large this seemed to be working. It took until the hour mark before Clydebank had another noteworthy effort on goal. A free kick from the right by Higgins was met by Vezza at the back post but he could only steer the ball into the arms of the Largs keeper. 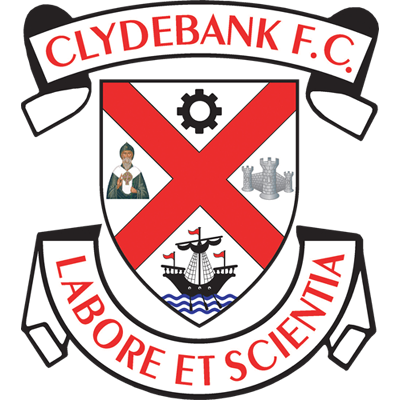 Despite the lack of goal scoring opportunities Clydebank could have snatched a point with four minutes remaining. Rowan curled a powerful cross low into the box and Nicky Little took all the pace off the ball beautifully, teeing it up for Shelvey. The Bankies striker could have taken a touch, but elected to shoot first time and unfortunately blasted the ball over the bar from twelve yards. 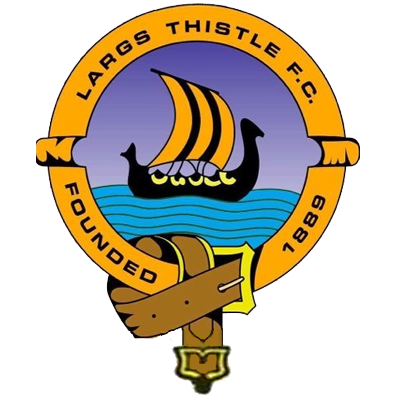 Largs are a tough nut to crack and giving them a two goal start is ultimately what lost the match. The Bankies defence were all over the place in the first five minutes or so. In fairness, once the players composed themselves they competed well, and could have earned a draw with the few chances that were created. There was a distinct lack of width today with McClair and Hepburn both disappointing. It was just one of those days when we just didn’t have enough to get past a side who were well organised. On a positive note, Duncanson looked the part at right back, making several dangerous forward runs and hopefully solving the right back problem to the end of the season. The defence are usually reliable and hopefully the individuals who were ‘off-colour’ today are back on form for the important Scottish Cup tie at Girvan next week.